Briggs Swift Cunningham II was born to race. Hailing from a wealthy Ohioan family — his father had interests in railways, meat-packing, commercial real estate, founded Citizens’ National Bank, and was the chief financier of two young developers named William Cooper Procter and James Norris Gamble (perhaps you’ve heard of them?) — Cunningham, or “Mr. C,” was a moneyed sportsman who dedicated his life to dominating gentlemanly pursuits, and did it with the kind of style rarely seen today. 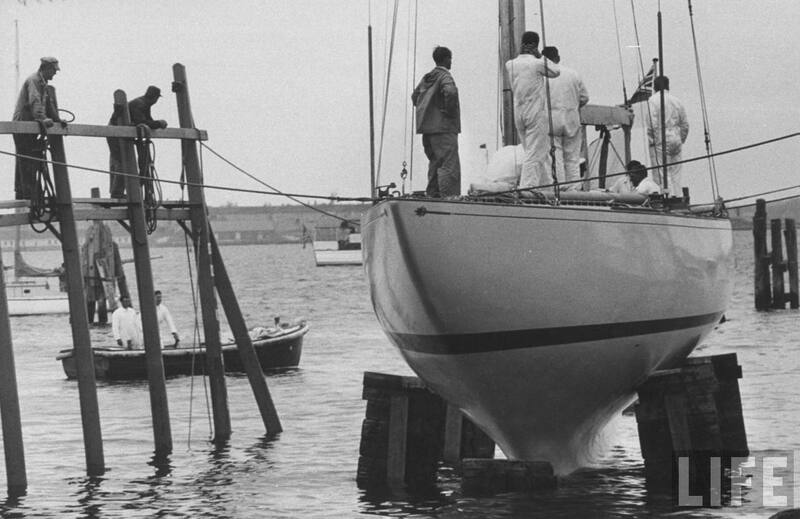 Born in 1907, he left his mark most notably in the realms of auto and yacht racing. Were he born today, I still have a hard time imagining him doing anything else. Cunningham doesn’t strike me as the kind of man who would base jump. Just doesn’t have the same elegance. As a child Cunningham summered in the Northeast, where his love for sailing was born. After his family relocated to Southport, CT he joined the Pequot Yacht Club at the age of 17, thus beginning a love affair with yachting that would last over 30 years. He entered Yale to become an engineer, but it didn’t stick. He left university and married first wife Lucy Bedford, daughter of a Standard Oil heir, whose enthusiasm for sport and yachting — and money to burn — matched his own and on their honeymoon they travelled the world, attending regattas and watching the Monaco Grand Prix. Monaco would spark the beginning of Cunningham’s love of auto racing. He spent the years before WWII racing the seas and cars and getting his pilot’s license. He was also an excellent shot. When he was turned down by the US Navy on account of his age and asthma, he just bought his own aircraft and flew anti-submarine patrols along the eastern seaboard with the Civil Air Patrol and US Coast Guard throughout the war instead. The man wasn’t one to take limits — or the word “no” — seriously. After the war, he turned his attention to auto racing, with an eye on competing — and winning — in the 24-hour races at Le Mans, France with American cars and drivers, a feat never performed. In 1950 he entered the race with two modified Cadillac Coupe de Villes against a field of Ferraris, Aston Martins and Jaguars and still managed to come in 10th and 11th. The next year he returned with a car he designed and built himself. That car failed to finish in 1951, but the design he introduced the 1952 season was his most successful and considered by many to be the first true American sports car: the Cunningham C-4R. The C-4R finished fourth at Le Mans — Cunningham himself drove 20 of the 24 hours because his partner was ill! — with Cunningham (and American automotive manufacturing) earning the esteem of the European racing establishment. Americans were no longer merely hot rodders. Cunningham C4R. Image via Team Quail. We also have Cunningham to thank for the familiar racing color scheme shown above. 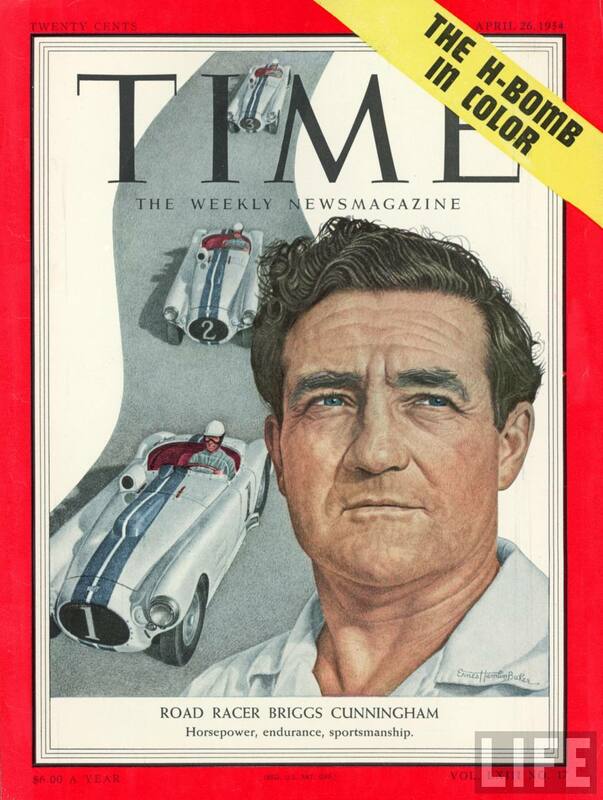 In 1950, when he entered his first race at Le Mans, America did not yet have an established national racing color, so he picked one — white with two broad blue stripes that stretched the length of the car. The stripes were called “Cunningham stripes” for years. 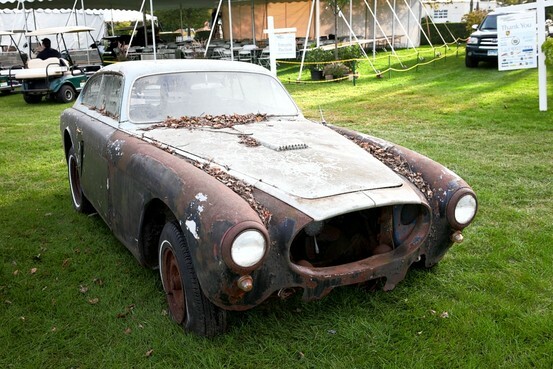 Cunningham continued to manufacture cars until 1955 and they remain highly prized by collectors, as evidenced by the excitement surrounding the discovery of the final missing C-3 — one of only 25 cars manufactured — in a Connecticut barn just a few weeks ago. Missing C-3. Image via WSJ. 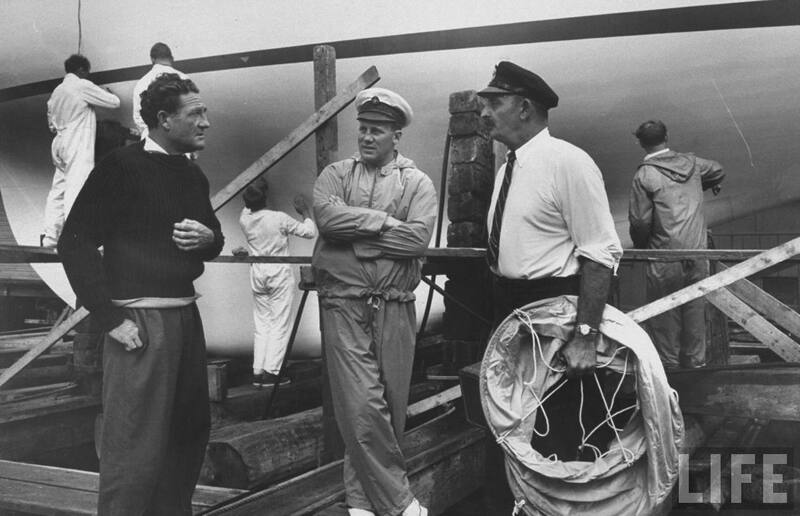 Cunningham would also excel in the realm of yachting in the 1950s. In 1958, he was tapped to skipper the American yacht Columbia in the America’s Cup, leading to a rout of the British challenger, Sceptre, 4-0. 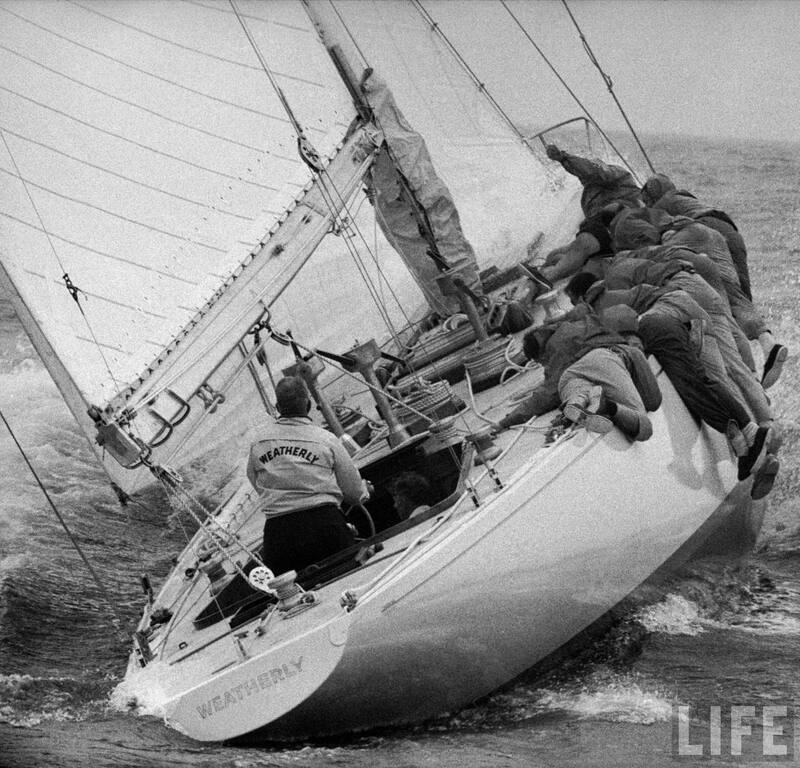 In September of that same year, LIFE photographer George Silk captured some amazing images of the yacht race and teams in Newport, Rhode Island. 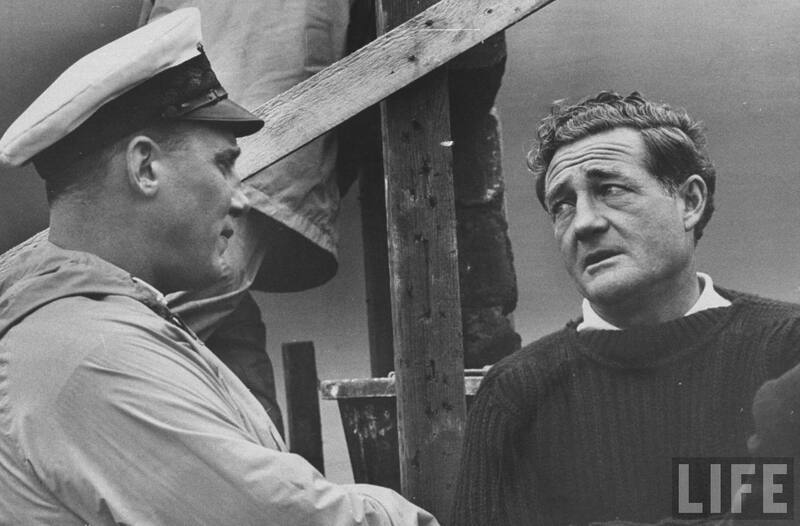 Skipper of the Scepter, Graham Mann, with Cunningham. The Columbia, left, and the Scepter. 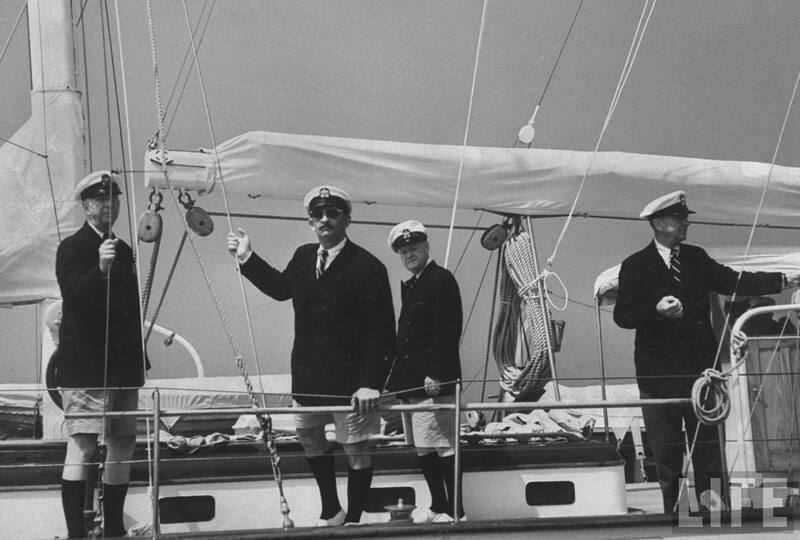 America’s Cup Race committee, John Dickerson (far right). 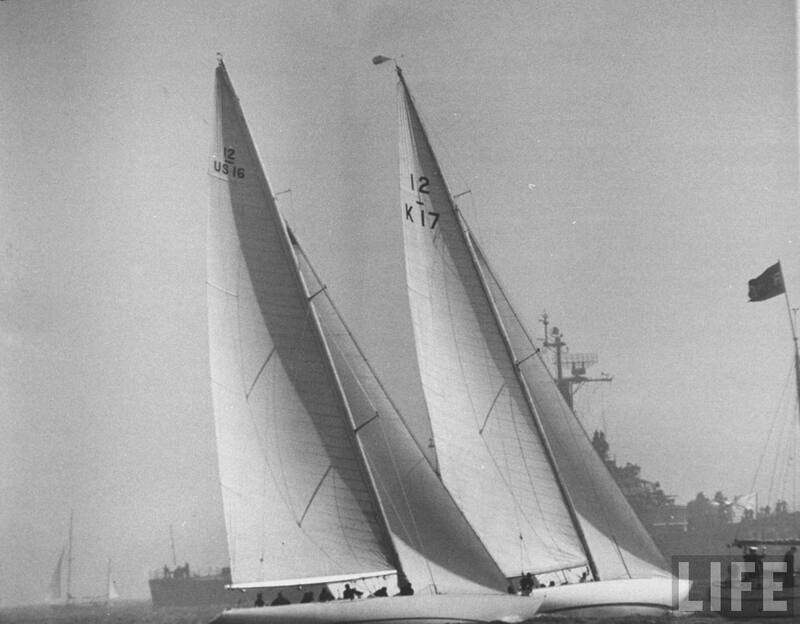 ”Briggs was like a fine violinist with boats,” said Victor Romagna, who sailed with Cunningham in the competition. ”He would need someone to do the tuning, as one might with a Stradivarius, but afterwards, we would hand the boat back to Briggs. Then he would play the instrument absolutely perfectly.” Via: NYT. 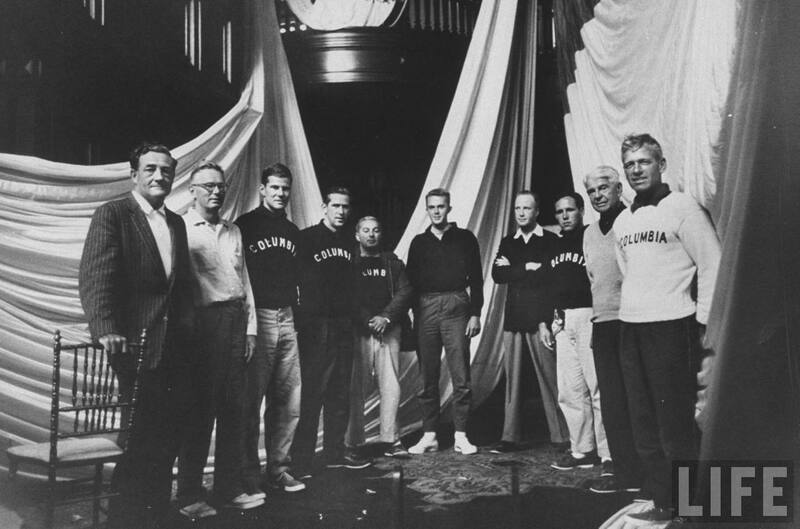 After his victory at the America’s Cup in 1958, Cunningham continued to sail the Columbia, as a member of the New York Yacht Club. As was typical for Cunningham, he also managed to introduce a technical innovation to sailing in the form of a now-commonly used device called the “Cunningham” that adjusts sail tension. 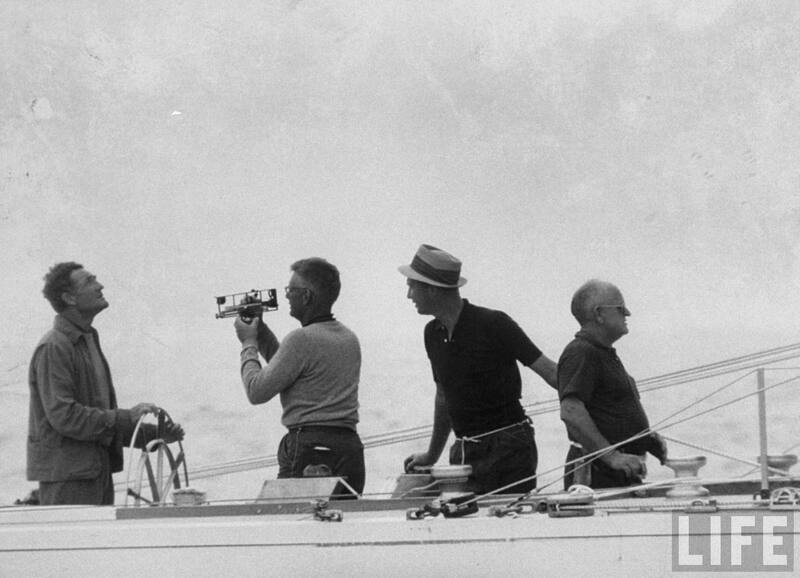 Was pleased to find footage of Cunningham, circa 1956, at the Pequot Yacht Club. The film is silent, but he appears around the 3 minute mark, dressed in black. 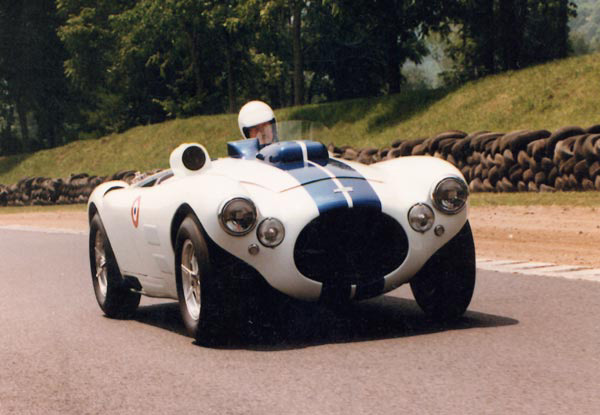 Cunningham continued to race at Le Mans into the 1960s, but instead drove teams of Corvettes, Maseratis and Jaguars. When he became unable to compete as he grew older, he began to unload his massive collections. He sold off his cars in the late 1980s and he parted with his libraries of motoring and yacht books, his art collection and his models in the early 1990s, much of it going to the Herreshoff Marine Museum in Bristol, Rhode Island. Fittingly, he was inducted into both the America’s Cup Hall of Fame and the Motor Sports Hall of Fame. Cunningham died in 2003 at the age of 96, survived by his second wife Laura, children, stepchildren, grandchildren and great-grandchildren. So excited to connect with you! Your grandfather was an amazing fellow and I loved discovering his story. I’m glad you enjoyed the post. Unfortunately I don’t have good news about the picture of him holding the Cup, which I can’t find either. Seems a bit odd, but I’m officially on the lookout for you. Hope all is well. Many thanks for stopping by. You are currently reading Man of the Hour: Briggs Swift Cunningham II at Quite Continental.